I stayed at the Waldorf Astoria Las Vegas last month. The property was formerly the Mandarin Oriental. Since I was only in Vegas for one night, I decided to use my weekend Hilton certificate. As a Hilton Diamond, I wanted to check out the benefits at this hotel. The Waldorf Astoria Las Vegas is located on the strip, though the building seemed overshadowed by the modern, sleeker-looking Aria Resort and Casino. In fact, I got distracted too. Somehow, I ended up with this picture instead. The hotel does not offer self-parking. Valet service is available at $35.00 per night (which, by the way, I think it’s over the top, just like parking in NYC). I haven’t visited Las Vegas in years, but it seemed that the days of free self-parking on the strip are gone with the exception of a few places left. We decided to just get a taxi from the airport ($15-$20 range with tips). Bell services are ready to assist with your luggage needs. You’d take the elevator to the Sky Lobby on the 23rd floor to check-in. You can’t really get lost with these elevator options. Elevator options from the L level. We got there just a bit before the 3PM check-in time. There was only one front-desk staff helping a guest and another at the concierge desk. Another guest was waiting ahead of me. Fortunately, two staff members quickly came out to assist. The check-in clerk apologized for the wait, and let us know that our room is ready. The room was upgraded to a “City View”. She also let me know that as a Hilton Diamond member, I have $50 credit that I could use towards room service dining or breakfast dining at the hotel. She then stepped out to point us to a different set of elevators to would take us down to the guest rooms. The room is a standard room – comfortable and spacious. Great bath amenities. The body lotion smells so good. Remnants of Mandarin Oriental is present; I see “Mandarin” on the phone display. You have options if you are a coffee or a tea drinker. In-room snacks are also available but they will cost you. Uniquely, nestled with the snack options is a “Lover’s Kit”. I have to admit that this is a first. I don’t recall ever seeing this option at any other hotels. Vegas, I guess. While most Hilton properties include complimentary breakfast for the stay, I decided to use the $50 credit (for the entire stay) at the hotel’s Zen Kitchen. 1 order of Golden Waffles with fruits. Beautiful presentation. Tasty too! The restaurant’s decor is nice and the service is wonderful, but our bill came out be a little over $70 with gratuities. It was fine given the $50 in hotel credit, but the price tag is excessive for breakfast. I don’t think it was worth it. * Maybe we were spoiled by the all-you-can-eat buffet at Aria on the first day, but the food there was great and it’s a much better value for the price (more in a separate post). *Side note: While Waldorf Astoria Las Vegas is not listed on the Hilton’s “resort list“, the breakfast triggered the $250 resort credit if you have the Hilton Aspire card. YMMV. The Waldorf Astoria is a fine hotel. The room is comfortable and the service is always professional. If you like to shop, you can follow the sky bridge to get to the The Shops at Crystals. The hotel is never crowded as there isn’t a gaming facility on-site. I’ve only ever stayed at 3 hotels in Vegas. Bally’s. Casear’s Palace. Waldorf Astoria. Waldorf Astoria is the best of the lot in my opinion, but given other hotel options in the area, I would be inclined to try a different hotel the next time I visit. Which hotel is your favorite on the Strip and why? Sound off below. 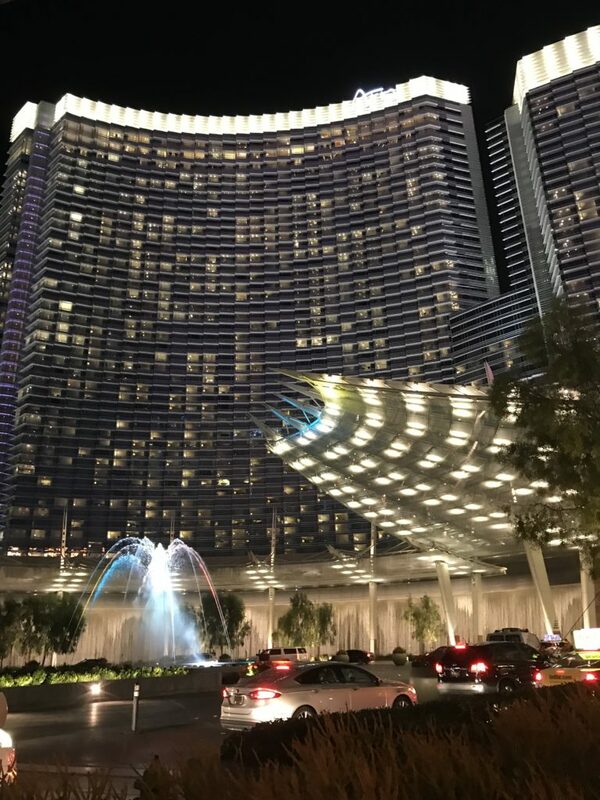 The post Hotel Review: Waldorf Astoria Las Vegas appeared first on TravelUpdate. Beware: Can you Get the IHG Premier card bonus if you have an IHG Select Card? How Did You React to Ballistic Missile Alert in Hawaii?